Join us for The Shine’s 3rd Birthday! 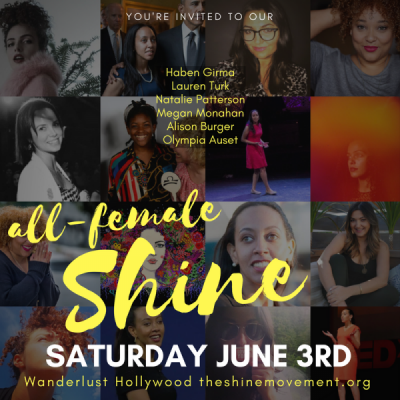 Also included in our line-up for the June 3rd show, is meditation master Megan Monahan, signer-songwriter and activist Lauren Turk, and poet and artrepreneur Natalie Patterson. We have so much power when we commune and celebrate one another’s voices. We strive to bring together a diverse set of authentic voices and stories. This event is meant to harness the power of the feminine voice and the compassion strength and creativity that anchor that voice. We are hoping you will join us at the beautiful Wanderlust Hollywood, a space that has its origins in the amazing energy of the decades of yoga practiced there by the Golden Bridge tribe. If you haven’t already bought a ticket for this night of connection, food, music, meditation, inspiration and philanthropy please head to grab your tickets and be there with us. The Shine is a mindfully-curated variety show currently hosted in New York and Los Angeles. This alcohol-free event features music from local bands, inspiring short films, grassroots philanthropy, delicious food, and storytelling. We are a 501c3 and our mission is to create a fun and welcoming social environment where attendees can strike up meaningful conversations and make lasting connections that leave them feeling inspired to do more, give more, and be more.